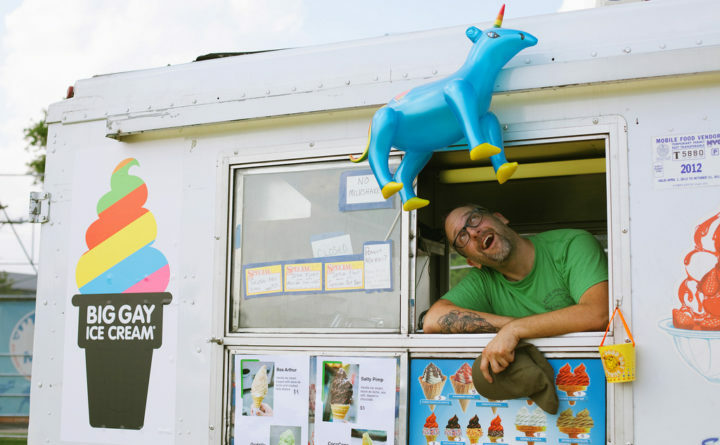 Pittsfield native Doug Quint co-founded Big Gay Ice Cream in 2009 in an ice cream truck he drove on the streets of New York City. Pints of his ice cream now can be found at Shaw's grocery stores throughout Maine. 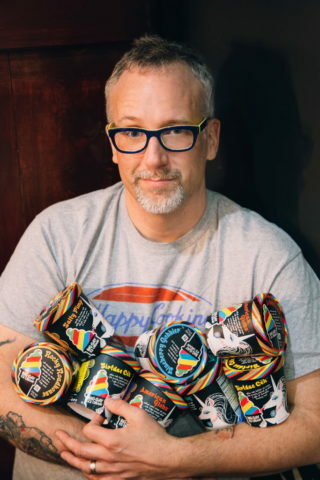 Pittsfield native Doug Quint, the co-founder of New York City-based Big Gay Ice Cream, has the kind of ebullient confidence that remains unflappable even in the most challenging of times. Such as when the Westboro Baptist Church, known for its extreme homophobic views, attacked him on Twitter. Or when, in the days when he drove his Big Gay Ice Cream Truck through the streets of New York City, groups of kids on the street would try to taunt and embarrass him. “You think you can really start something with me? Good luck,” Quint, 46, said recently. Still, even an unshakeable person can get shaken sometimes. For the ice cream entrepreneur, that moment happened quite recently, when he saw a photograph his sister had taken while standing in the ice cream section of the South Portland Shaw’s grocery store. Behind her head were rows of his ice cream pints, unmistakable with their bold black-and-rainbow, sassy-unicorn-bedecked design. In March, the ice cream company that he started nine years ago almost as a performance art project in a rented New York City ice cream truck (more on that later), has greatly expanded its range by selling pints in stores from Baltimore to Bangor and beyond. In March, the Shaw’s and Star Market grocery chains, with 153 stores throughout New England, signed on to carry the brand. After the deal was struck, Quint figured that there was a chance Big Gay Ice Cream could be stocked in some stores in Maine. Maybe he’d see it in Portland, he thought, the city that’s widely considered to be Maine’s most liberal. But the ice cream traveled much farther than that. Then, a childhood friend shared a photo of the ice cream aisle at the Shaw’s in Waterville, and Quint knew he had to drive to Maine to see it for himself. He got to the Shaw’s grocery store in Augusta 15 minutes before closing, and as he approached the ice cream aisle, he took a deep breath to steel himself. 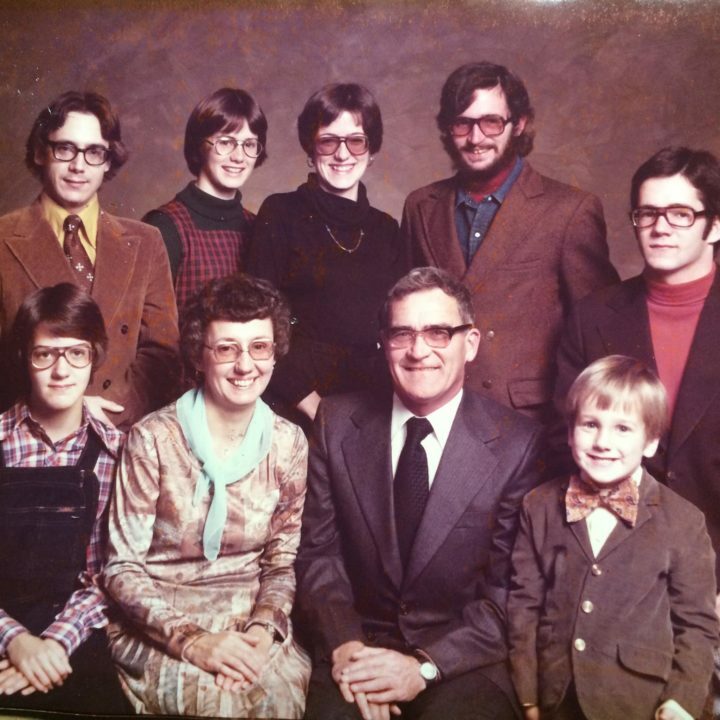 Doug Quint, lower right hand corner, at home with his family in Pittsfield in 1975. For Quint and his ice cream, getting from Maine to Manhattan and back again has been a long and sometimes rocky road. In Pittsfield, he was the youngest of seven siblings in a close-knit family with deep ties to their central Maine community. His dad delivered propane gas and his mother, also a Pittsfield native, studied music education at Boston University. They met in Maine while she was on a break from school, and although the couple lived in Boston for awhile after they were married, they moved to Maine to raise their family. Quint has good memories of growing up in Maine, including some cherished ice cream-related ones. But he has unhappier memories, too, of being a teenager who didn’t quite fit in. Quint is, as his company’s name proclaims, gay, and it wasn’t easy to be different in a small, rural town in the 1980s. He did have many good friends at Maine Central Institute, the town academy and semi-private high school that serves all high school aged students from the local district as well as tuition students from all over. But some of his classmates were cruel and bullied him. Fortunately, he had a way out. He was a gifted bassoonist, and spent his senior year of high school as a fully matriculated freshman at the University of Southern Maine focusing on bassoon performance. After graduating from MCI in 1989, he left for New York City, where he attended the Manhattan School of Music and then the Julliard School. There, he finally felt free to be himself, and he loved the feeling. “When I got to New York, it was such a non-issue,” Quint said. In his 20s and 30s, he worked as a professional musician. He played in orchestras and summer festivals in Europe, the Caribbean, and the United States, especially in and around New England, including a stint with the Boston Pops. Quint enjoyed the work, and decided in his 30s to continue his studies and pursued a doctorate in bassoon performance. The course work was challenging, and in the spring of 2009, as he rigorously prepared for his comprehensive written and oral exams, he decided he would soon need a break. Inspired by David Sedaris’ “SantaLand Diaries” essay and radio performance piece, about the humorist’s stint as a somewhat flawed Macy’s elf named Crumpet, Quint decided that he wanted to do something purely for the experience. But it was ice cream truck driver that rose, like cream, to the top of the weird summer job pile. He and Bryan Petroff, the co-founder of the company who has been with it from the beginning, started dreaming of how they would distinguish themselves from the rest of the ice cream truck pack long before they got wheels on the pavement. He and Petroff settled on the perfect name: the Big Gay Ice Cream Truck, and launched a blog and a Facebook group. At the time, the show “Queer Eye for the Straight Guy” was still on, and they felt as if they were giving ice cream the Queer Eye treatment. The name, silly and irreverent, caught on, and even before the truck was up and running, they started attracting fans. Then, after they found a guy who owned a fleet of ice cream trucks and let them sign one out in exchange for a percentage of the day’s profits, their fans were surprised that the Big Gay Ice Cream Truck was not just performance art. That first summer, they didn’t make their own ice cream, instead freezing it from a commercially available liquid ice cream mix. They had a great time, but they did lose a little money. The second summer, they decided to do it again, with a little more business sense, and found they started to make a profit. It was a good moment for food trucks: the Great Recession made cheap eats trendy and Twitter made finding the truck a fun challenge. Doug Quint, a Pittsfield native, helped to found New York City-based Big Gay Ice Cream in 2009. This spring, pints of the ice cream made it back to his home state. They can be found in Shaw's Supermarkets throughout Maine. But it was more than their friendly demeanor and funny name that made the truck a hit. It was also the product: soft serve ice cream garnished with upscale, imaginative toppings including balsamic vinegar, lemon curd, whiskey walnuts and much more. The Salty Pimp, one of their most popular offerings, is a vanilla soft serve cone infused with dulce de leche, sprinkled with sea salt and dunked in chocolate. It and other flavor combinations were a big hit on the New York City streets and also got them noticed by food personalities, most notably Rachael Ray. She featured them on her show in 2010 and almost immediately, business at the truck blew up, Quint said. “The day after it aired, tourists just came and swarmed us,” he said. In 2011, they opened their first brick-and-mortar store in New York City and the ice cream empire was on its way. Today, there are three stores in New York City and one in Philadelphia. Last year, they started producing hard-pack ice cream for the first time, packing it in pints that were initially sold around the New York City metropolitan area (soft serve and hard ice cream is made from the same ingredients, Quint said, but is frozen differently. Soft serve is frozen just before it is eaten). This year, they’ve increased their distribution area, and now pints of their hard-pack ice cream are available for sale in Delaware, Maryland, Pennsylvania, New Jersey, New York and all five New England states. In Maine, shoppers at all Shaw’s stores from Sanford in the south to Dover-Foxcroft in the north can enjoy seven of the company’s signature flavors, including Salty Pimp, Blueberry Gobbler (vanilla ice cream, blueberries, pie crust pieces and blueberry balsamic swirls) and American Globs (fudge-covered salted pretzel balls, fudge-covered pretzel pieces and a fudge swirl in malted sweet cream ice cream). “They have developed a loyal following in other parts of the Northeast with great tasting ice cream and really fun flavors,” Teresa Edington, community relations manager for Shaw’s and Star Market, said. For Quint, having his ice cream available in Maine has been a powerful, affirming experience. The fact that Big Gay Ice Cream is now for sale in the Maine towns he needed to escape from a quarter of a century ago is a sign of progress and change that makes him happy.